Hydrogen Isotope Research Center, University of Toyama, Toyama, Japan. Copyright © 2013 Satoshi Akamaru et al. This is an open access article distributed under the Creative Commons Attribution License, which permits unrestricted use, distribution, and reproduction in any medium, provided the original work is properly cited. In this study, the surfaces of NaCl particles were modified with metal films using the polygonal barrel-sputtering method. When Pt was sputtered on NaCl particles, the individual particles changed from white to metallic. Characterization of the treated samples indicated that thin Pt metal films were uniformly deposited on the NaCl particles. 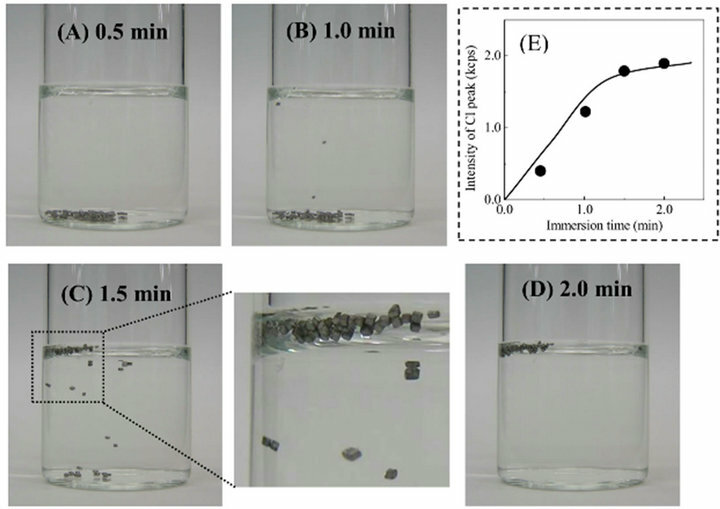 Immersion of the treated NaCl particles in water revealed that they floated to the surface of the water with the increase in the immersion time, although their original cubic shapes remained unchanged. The floating phenomenon of the Pt-coated NaCl particles, as mentioned above, suggests that NaCl was dissolved by the permeation of water through invisible defects such as grain boundaries in the Pt films, leading to the formation of hollow particle-like materials. It should be noted that uniform film deposition on the NaCl particles could also be achieved by sputtering with Au or Cu. Based on the obtained results, our sputtering method allows uniform surface modification of water-soluble and water-reactive powders that cannot be treated by conventional wet process using water. Modification of particle surfaces is an important technique in various fields of science and industry. For example, particle surface modification plays an important role in the preparation of catalysts [1-3], photocatalysts [4,5], and electrocatalysts [6-9]. Surface modification is also frequently used to add functions such as gas-sensing to powders . Among the available methods for particle surface modification, wet processes including electroplating [11, 12] and impregnation [1-3,7] are used the most widely to prepare functionalized powders. However, wet processes result in wastewater streams which not only require treatment to remove any harmful residual chemicals, but may also be potentially damaging to the environment. In addition, powders such as ionic crystals and organic semiconductors that are soluble or reactive in water cannot be treated by conventional wet processes containing surface modification processes using water. Thus, only a limited number of powders can be modified using wet processes. In contrast, sputtering [13-16], which is categorized as a dry process, modifies material surfaces without water. As a result, no wastewater is discharged during surface modification using the sputtering technique. Moreover, sputtering allows even surface modification of water-soluble and water-reactive materials. These advantages of sputtering address the problems of wet processes, mentioned above. However, conventional sputtering systems can only treat planar materials. Based on this background, we developed a novel surface modification method for powders using the sputtering technique, which we call the “polygonal barrel-sputtering method” [17-32]. The polygonal barrel-sputtering method has been successfully used for uniform surface modification of particles composed of metals , alloys , metal oxides [19-24], polymers [25-27], and carbon [28-32]. 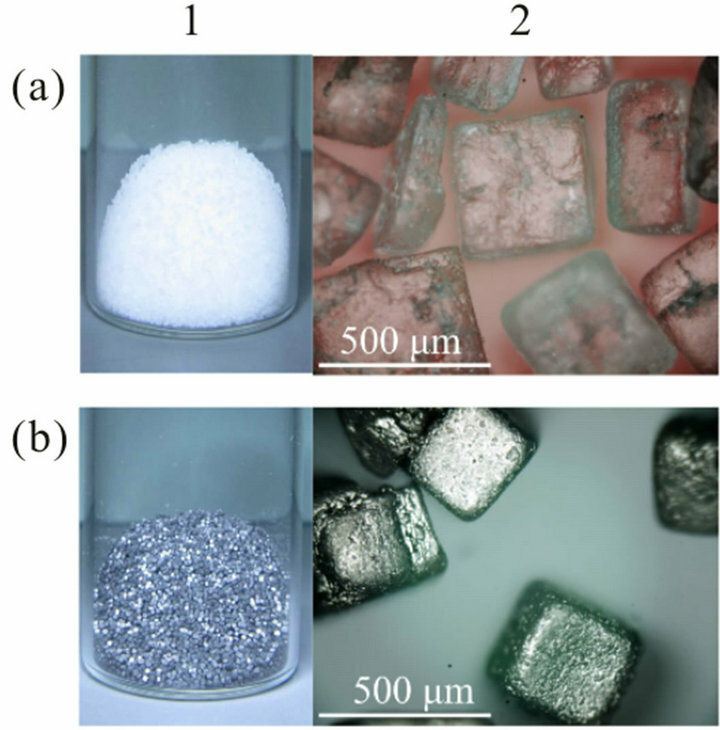 In this study, the surfaces of NaCl particles were modified with metal films using the polygonal barrel-sputtering method to demonstrate the application of our method to the surface modification of water-soluble and water-reactive powders. 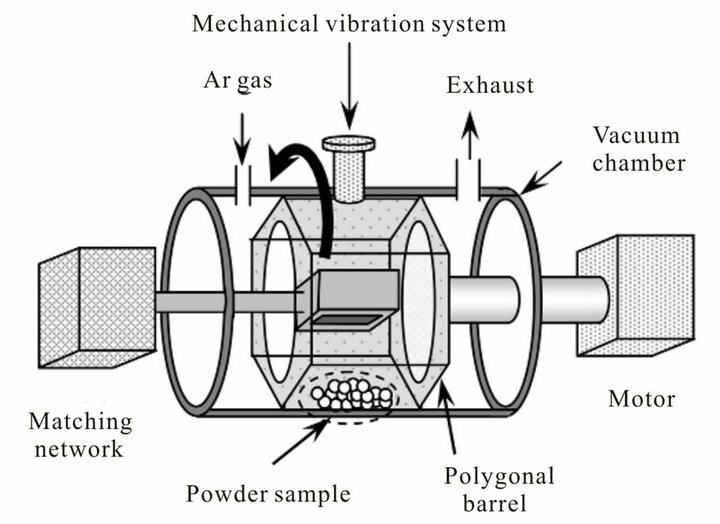 A schematic diagram of the polygonal barrel-sputtering method used to prepare the samples is shown in Figure 1. In this sputtering system, a polygonal barrel containing a powder is rotated or oscillated during sputtering. The powder is stirred by this action, allowing uniform modification of the particles. In this study, particle surface modification was performed using a Pt (purity: 99.95%), Au (99.99%), or Cu plate (99.99%) with a size of W 50 mm × L 100 mm as a target for sputtering. The AC power for sputtering was supplied by RF power generation (13.56 MHz). Samples were prepared following reported procedures [17-32]. NaCl powder (particle size: 250 - 500 μm, Kanto Chemical or The Salt Industry Center of Japan) was introduced into a hexagonal barrel and then the barrel was placed in a vacuum chamber. Subsequently, the vacuum chamber was carefully evacuated using rotary and diffusion pumps. After the pressure was decreased to less than 8 × 10−4 Pa, Ar gas (purity: 99.9999%) was slowly introduced into the chamber. Sputtering was then performed at a gas pressure of Ar of 2 Pa without heating while the hexagonal barrel was rotated at 3.5 rpm to stir the NaCl particles. The AC power and sputtering time were 100 W and 30 min for sputtering of both Pt and Au. Cu was sputtered at 195 W for 5 h. After sputtering, N2 gas was gradually introduced into the vacuum chamber until it reached atmospheric pressure, at which point the prepared samples could be extracted. The appearance of the NaCl powder sample before and after sputtering was observed using an optical microscope (LV150; Nikon). 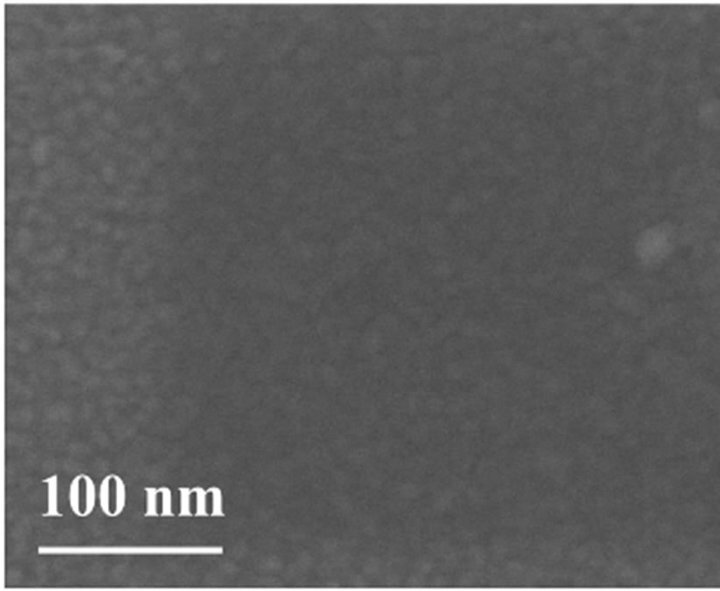 The modified NaCl particles were characterized using a field emission scanning electron microscope (FE-SEM; JSM-6701F; JEOL) with an energy-dispersive X-ray spectroscope (EDS; JED-2300; JEOL) and X-ray diffraction (XRD; PW1825/00; Philips). Figure 1. Schematic diagram of the polygonal barrel-sputtering system. For an immersion test, the treated sample was added to pure water. The solution used for the immersion test was analyzed by X-ray fluorescence analysis (XRF; PW2300, Philips) using a Rh X-ray tube. Figures 2(1a) and (1b) show photographs of NaCl powder before and after sputtering with Pt, respectively. Before sputtering, the NaCl sample was white and the shape of each particle was obscure. After sputtering, the NaCl sample changed from white to metallic and the cubic shape of the particles was clearly seen because of their apparent contrast. Optical microscopic images of the untreated and treated NaCl particles are presented in Figure 2(2). The untreated NaCl particles were transparent and their surfaces were relatively rough (Figure 2(2a)). Following treatment, all of the particles were a uniform metallic color and their clear shading visibly emphasized the roughness of the original surfaces of the NaCl particles (Figure 2(2b)). Overall, the NaCl particles were uniformly covered with metallic films by the polygonal barrel-sputtering method. The NaCl particles before and after sputtering with Pt were observed by FE-SEM and EDS. The results obtained at low magnification (×110) are presented in Figure 3 (a: before, b: after sputtering). The FE-SEM images reveal that the treated and untreated particles possessed similar morphology (Figure 3(1)). In the EDS mapping images, however, Pt element was detected only for the sputtered particles, as shown in Figure 3(2). Remarkably, the shape of Pt mapping is similar to those of Na and Cl mappings, suggesting that the Pt films were uniformly deposited on the NaCl particles. It is emphasized that a relatively smooth surface was observed in an FE-SEM image obtained at a high magnification of ×190,000 (Figure 4), implying that the deposited Pt films contained no remarkable pores or damage. Figure 2. (1) Photographs and (2) optical microscope images of NaCl samples (a) before and (b) after sputtering with Pt. Figure 3. (1) FE-SEM images and (2) EDS mapping images of NaCl particles in the samples (a) before and (b) after sputtering with Pt (magnification: ×110). Figure 4. FE-SEM image of the surface of a NaCl particle after sputtering with Pt (magnification: ×190,000). obtained in the 2θ range of 30˚ - 50˚. Before sputtering, two peaks were observed at 2θ = 32.06˚ and 45.44˚, which were assigned to the NaCl(200) and NaCl(220) peaks, respectively, that are characteristic of NaCl with a cubic structure (JCPDS No. 05-0628). The XRD pattern of the Pt-sputtered sample contained two additional peaks at 2θ = 39.99˚ and 46.39˚ along with the diffraction peaks of NaCl. The new peaks in this pattern correspond to the signals of Pt(111) and Pt(200), demonstrating that the deposited films consisted of Pt metal with a face-centered cubic structure (JCPDS No. 04-0802). However, the observed Pt peaks were slightly broad. In our previous study on the surface modification of Al2O3 particles with Pt films, broadness of the Pt peaks was attributed to the thinness of the layer of deposited Pt . 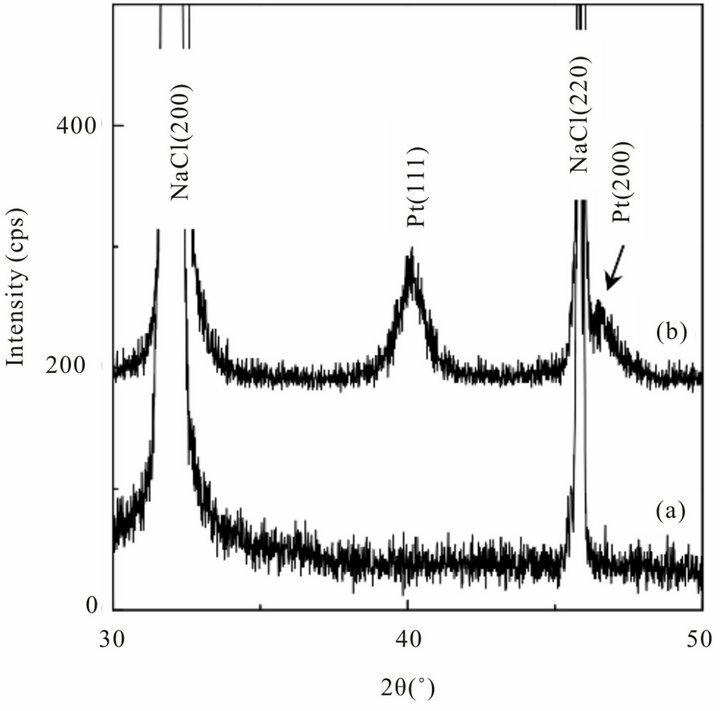 On this basis, the appearance of broad Pt peaks in Figure 5(b) most likely shows that the Pt films deposited on the NaCl particles were very thin. Figure 5. XRD patterns of NaCl samples (a) before and (b) after sputtering with Pt. Figure 6. Photographs of NaCl particles covered with Pt films in a bottle containing pure water after immersion times of (A) 0.5 min, (B) 1.0 min, (C) 1.5 min, and (D) 2.0 min. (E) Intensity of Cl peak obtained by XRF measurements of the solution used for the immersion test as a function of immersion time. floating particles retained their cubic shape, as seen in the magnified photograph of Figure 6(C). Figure 7. (1) Photographs, (2) FE-SEM images, and (3) EDS mapping images of (a) Au and (b) Cu-sputtered NaCl particles (magnification of FE-SEM and EDS images: ×110). of NaCl was not attributed to the collapse of the Pt films, but to the permeation of water through the Pt films. Remember that there were no remarkable pores or damage in the Pt films formed on the NaCl particles, as depicted in Figure 4. Therefore, it is assumed that the deposited Pt films contained invisible defects such as grain boundaries through which water molecules could permeate, resulting in gradual dissolution of the NaCl particles. Furthermore, the tendency of the particles to float suggests that the permeation of water through the Pt films was very slow, leading to the formation of hollow particle-like materials. This unique characteristic may be useful in biomedical applications such as drug-delivery systems [33,34]. Sputtering with Au and Cu was also performed to investigate the effect of the kind of sputtered metal on surface modification of the NaCl particles. 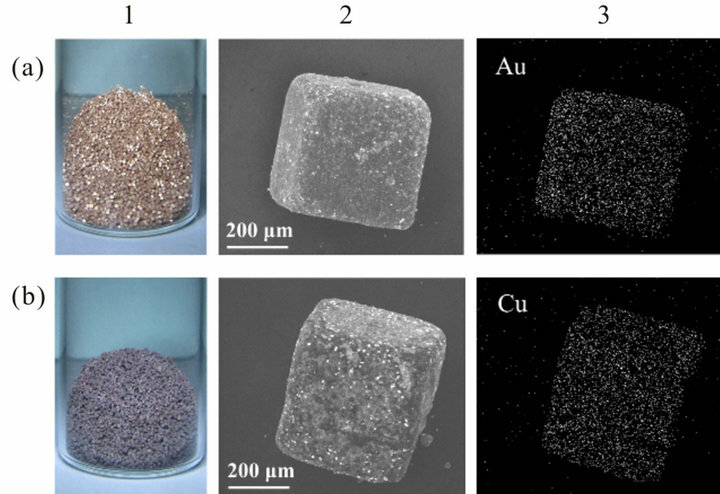 Photographs of the samples after sputtering with Au and Cu are illustrated in Figures 7(1a) and (1b), respectively. For both samples, their color changed to that originating from the sputtered metals. When the particles in each sample were observed by FE-SEM and EDS, Au or Cu was detected correspondingly and the EDS mapping images reflected the SEM images (see Figures 7(2) and (3)). From Figure 7, it is clear that coating the NaCl particles with a uniform film is achieved by our sputtering method independent of the kind of sputtered metal. In this study, NaCl particles coated with metal films were prepared using the polygonal barrel-sputtering method. Metal films composed of Pt, Au, or Cu were uniformly deposited on all of the NaCl particles, demonstrating that the polygonal barrel-sputtering method can be used for surface modification of water-soluble and water-reactive particles. In addition, based on the results of this study and our previous reports, our sputtering method makes it possible to uniformly modify the surfaces of various powder samples with not only metals but also alloys, metal oxides, and so on. Consequently, the polygonal barrelsputtering method is useful in the research and development of functionalized powder materials.